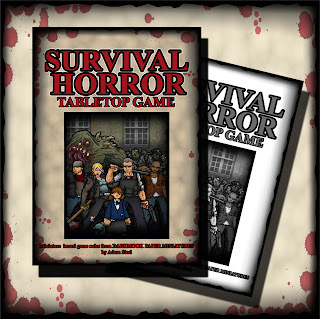 SURVIVAL HORROR TABLETOP GAME IS HERE! Special introductory price of $12.45 until 18 November 2012! 2. Do you include stats for previous sets you've released, or can they be incorporated somehow? Hi! Included minis are 20zombie cops, 5 fast zombies, 1Kid, 1Veteran Cop, 1Civillian, 1Biker, 1Zombie Hunter (all new), recoloured Bio Weaon, 10 Zombie Hounds. I will be releasing stat cards for previous sets on my blog (and new website when it is up and running), along with play test reports, scenarios and gaming ideas. Hope that clarifies things a little! Yay, finally! Must head over to Rpgnow and get hold of it. Just grabbed it and as Revaj i found no Hounds in the set. I got the Dog Days and Compendium set, so no problem for me. But i think u should fix this. On the plus side - the design looks great and i hope i will get to try the rules soon. Hi Reivaj-many thanks for bringing this to my attention! Somehow managed to upload the file with that page missing! If you can message me with your e-mail I will get the page to you asap! In the rules there is reference to character cards. But i can find none. Am i missing something or are they missing too? Wow, I ahve really dropped the ball on this one! Updating the file on RPGNow-can you guys let me know if you receive an e-mail regarding the updated files? Received your email. Thanks for the fast fix. Great stuff-thanks for keeping me updated, and hope you enjoy the game! I received 3 emails that the file has been updated on rpgnow and the flavour text now reads 59 pages. but the product information still reads 56 pages and if i download it is still the "old" version. I received 3 emails that the file has been updated on rpgnow and the flavour text now reads 59 pages. I have downloaded the new one ( about 56 MB and rightly 59 pages. The older is about 50 MB and 56 pages ) and it is fine. Maybe there is some problem (cookies or more) in your rpgnow account. Hi all-thanks again for your patience. I have removed all old files and have uploaded the new 59 page file. This should be the final version with ALL revisions. Thanks for Officer Vega. I wrote an email to rpgnow that i can´t receive the final version all though i deleted all cookies, logged out and back in, restarted my computer. it also does not show in my library as updated. i hope rpgnow can fix it. Hey Zapasnik-sorry to hear that. Hopefully they will get back to you soon-they are usually pretty good. It worked. Could finally download the 59 page version. I did not read through all the rules yet, but i had to rate 5 stars. 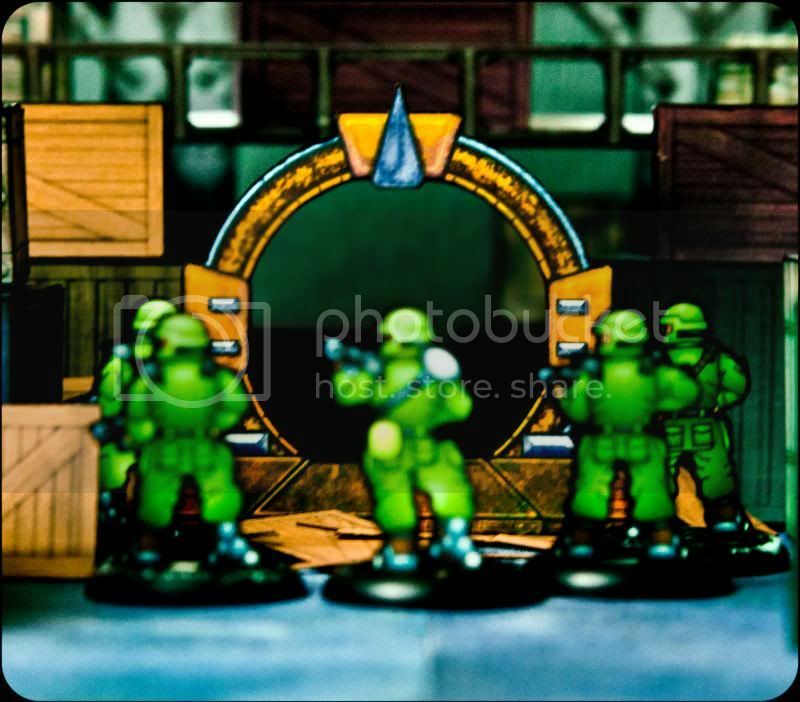 Are there solo player rules? 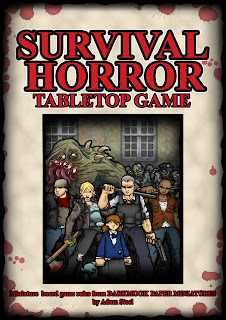 Rhannon, I will be posting a single player battle report on my blog in the coming weeks, but essentially as the zombies follow the pattern of attacking the nearest human you can play solo! I recommend using less room tiles and reducing the number of item/weapon cards by halving the numbers of each weapon/item (rounding down). Makes for pretty fun, intense games, as the zombies slowly mass! Any clue about the rules? I don't want the mechanics in full detail, but since i own a whole lot of crawl/skirmish-on-a-grid games, i'd be courious to know what this game brings on the table. Just drop me an e-mail and I will send you the file! And Parduz-it is an exploration/survival game in which tiles are laid to reflect the SHPD precinct house. 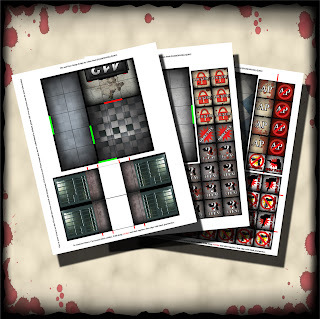 You need to find specific items to complete the mission and escape, and the zombies spawn as rooms are uncovered and they gain successful spawn points. The zombies are fairly easily picked off to start with, but once they start gaining a hold survival becomes a lot more difficult! Are diagonal movement and attacks possible in the game. I didn´t find anything about it. Another question that came up while reading was if the sides are qualifying for rear attacks? Diagonal movement and attacks are permitted. A rear attack is targeted at the rear 3 edges of the octagonal base. The sides and front 3 edges are treated as a frontal attack. Keep any questions coming and I will answer them here and compile a FAQ for the blog!